Especially in summertime there are a lot of different festivals, open air events or parade in the whole world, that usually spend a significant amount of money for event technics like Audio and Lighting. But mainly the Special Effects provide the extra "wow" factor. 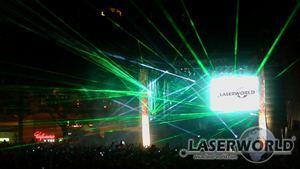 It is already quite common at electronic music events to use show laser systems to a certain extent. However, show lasers can even emotionalize classical music concerts! Electronic music at larger events basically emotionalizes people through a multitude of audio-visual impacts at the same time: The dry and rhythmic beats are accompaigned by different illumination effects that harmonize to the music and emphase the characteristics of the baseline. Conventional lighting effects like moving heads, fixed lighting fixtures or LED screens are the basis illumination concept, however, these lighting technologies mainly generate wide angle, colored effects or only create different colored moods. 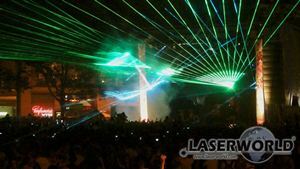 Laser light is different, as it is primarily used to integrate the spectators to the show. With having haze or fog in the air it is possible to visualize the laser beams in the whole area - even over longer distances. 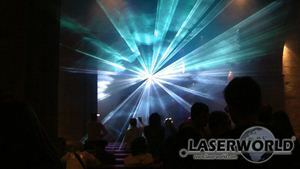 The ability to cover very long distances is a huge advantage of laser light. 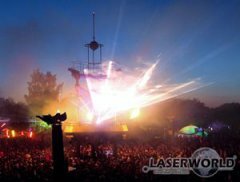 That makes show laser systems ideal for outdoor stages, as at large festivals the crowd may even reach to a reasonable distance to the stage, so it's hard to reach them with conventional lighting. As the music is not only playing for several minutes but over several hours and from live sets, it is not possible to "program" the laser show prior to the show (usually an "intor" is pre-programmed). 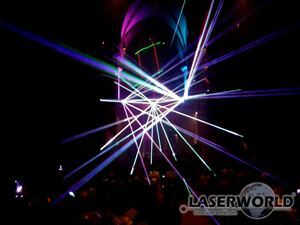 The real laser show during the live DJ sets is played live by a skilled live laser operator. Laserworld offers different show laser solutions for electronic music festivals - please ask our team for further details! It is not too common yet to use show lasers at Rock or Pop events yet, although they perfectly fit this kind of music as well: If played well by the laser operator, the showlasers can either emphase aggressive Hard Rock or Metal music as well as smooth pop ballades - and they perfectly underline the very mood of the music. 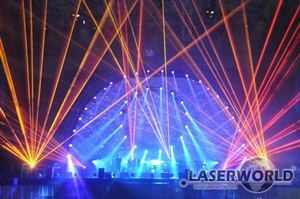 Most important are not only appropriate and professional show alser systems, but also the right live laser operators. 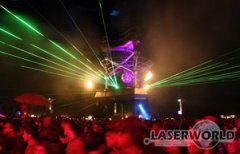 Like at electronic music festivals, show lasers can extend the reach of the stage lighting effects dramatically and thus are often used if either the stage is very wide or the audience is in significant distance from the stage. Laserworld recommends to rely on professional solutions for ourdoor events to prevent problems during operation. Especially the waterproof RTI NANO systems are recommended. Please see our rental information for further details - you will see that pricing is more than reasonable! 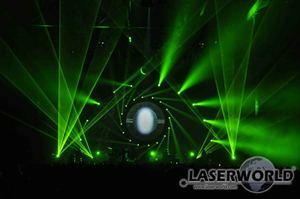 Most people wouldn't see show lasers or lasershows in the context of classical music. This of course depends on the audience: Our experience is that even elderly people get excited by a well done laser show. 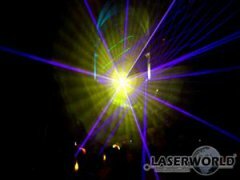 Laserworld e.g. accompaigned a katholic choire during service in a church - and the crown was overwhelmed by the emotions that were transported by the precise but smooth effects. Several hundred thousand people gather to celebrate in the streets at huge parades that take place all around the world: During carneval, to celebrate peace and freedom or equality. 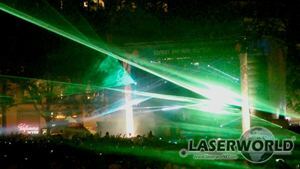 As it is tricky to use show lasers in direct sunlight, they are usually used at the final shows. 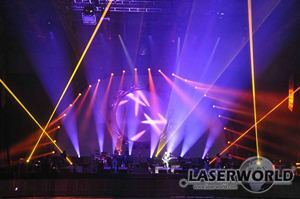 As it is essential to cover large areas in front of comparably small stages, so there normally is no possibility to place conventional lighting fixtures in the middle of the crowd. 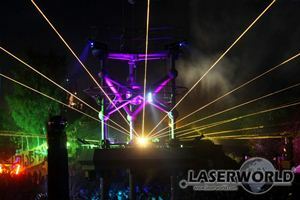 This is where show lasers have a huge advantage, as they can reach over extreme distances.